Your cabin is more than just a property in the wilderness. It is your own private getaway from all the noise and hastiness of the modern urban environment and possibly even a place where you plan to retire to one day. You truly need to keep it in an admirable state. With this in mind, if you plan to visit it soon and have some spare time on your hands, it might be a good idea to do a bit of a remodeling. Sure, some people may be immediately intimidated by the thought of having to spend a fortune on such a thing when there is so much you can do with your own two hands. Here are some DIY renovation ideas for your cabin. Although it is always the easiest way out to hire commercial painters to do your work this is usually not the right way to go. Paying a small fortune for others to do something you are afraid of at least trying also leaves a hole in your budget, which is one more reason why you should do this on your own. Sure, you will need some basic gear – another investment on your side, but once you are done painting, you get to keep all of these rollers and extensions for future use. A clear and undeniable win-win scenario if there ever was one. When it comes to your cabin, your surroundings will be beaming with life, however with the interior this might not be the case. Making an indoors jungle is your safest bet to remedy this, but choosing the right plants for the job won’t be the only issue you will be facing here. There is another problem that you will meet head on and that is the lack of space. Even though some people have cabins larger than other people’s homes, this won’t always be the case so if you want to gain more room, you will have to improvise. One of the most innovative DIY ideas is using hanging Wall Cubes for your houseplants. As we already mentioned, one of the greatest problems that your cabin will face is the aforementioned room issue. Now, when it comes to houseplants, that is nothing more than an aesthetic issue, but more often than not, problems will be quite practical. One of the things that you will face is an imminent storage room crisis but even this can be averted with the right course of action. Making your own shelf is as simple as it gets and simplicity of this design is one of its best qualities. 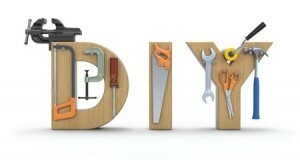 Minimum of materials, basic carpentry skill and some basic tools bought from an online tool shop will do the trick. Another thing you can do to help reinvigorate your cabin is deal a bit with your lighting solution. For example, one of the things you can do is start making your own lampshades. The best thing about this is that it is extremely simple yet highly entertaining. There is a wide array of materials for you to choose between and here you can let your imagination run wild. After doing this for a while, you will get into the grip of things, you might even think about making this hobby of yours into a part time job. Arts and crafts are always a viable career choice as well as extra source of revenue. Last but in no way least important, there is always an option of you revamping your old furniture. Even though you might love your cabin dearly, seldom will you have the opportunity to buy a brand new furniture for it. The good thing about this is that you don’t have to in the first place. Shabby chic is the next big thing, which means that your old furniture will do as well. Still, if this particular style is not your cup of tea, you can always try to polish and even paint these antiques in order to make them look new. All in all, this is a simple, affordable yet elegant addition to your cabin. As you can see, where there is will there is always a way and it is exactly this will, that most of these DIY projects will require in abundance. Apart from making your cabin looking great, this way of solving problems also helps your self-esteem. Just the thought of building something from nothing with your own two hands is an idea that is nearly impossible to top.